This month’s featured dish shows why Hilltop House Restaurant (93405 Willsey Lane, North Bay Oregon 97459) has been chosen as the Coos Bay World newspaper’s choice for Best Restaurant in Coos Bay. This selection of choice Pacific Tuna, wild-caught lingcod, and sumptuous choice prawns plays off of what makes the Oregon Coast a great place to eat: fresh ingredients, prepared simply and with great intention, in a setting that lends itself to laughter and long conversations. Hilltop House doesn’t just impress with its fresh Oregon seafood: it brings the whole package. Oregon is world-renowned for its rich, productive fisheries and the abundant catch that it brings. The sight of a fishing ship bobbing on the horizon is familiar to anyone who has ever visited the Oregon Coast, and they aren’t just out there enjoying the weather. They are filling those great big nets with the bounty of the Pacific, storing them underdecks until they can return to port and sort out what they manage to pull out. Crabbers are also abundant, and diving for mussels is not yet a lost art on the necklace of port towns draped across the seaboard. All this adds up to a thriving and busy fish market, where enterprising chefs can examine and select the finest ingredients. More than any perhaps any other protein, freshness matters when it comes to seafood. Built to be submersed in cold water constantly, the delicate proteins that make up the meats of fish and shellfish quickly degrade once they are exposed to the warmth of the open air. Even fish originating from the most efficient fishing operations spends some time in transit; it is one of the great missions in the seafood industry generally to guarantee the products that end up in the hands of the public are as fresh as possible, and fish sellers go to great lengths to make sure it can happen. All that being said, there is no better way to guarantee fresh fish than living right where they are caught. Coos Bay has long been one of the busiest ports on the West Coast and still remains the largest deep-draft coastal Harbor between San Francisco Bay and Puget Sound. It’s also the largest city on the Oregon Coast, which means it’s a little more metropolitan than some of its more northerly neighbors. People here are little more worldly, a little more hard to impress. Luckily, Hilltop House’s head chef Joseph Zamora has risen to the occasion. Dishes like his signature Mixed Grill show why Coos Bay is the best place in Oregon for seafood, and Hilltop House is the best place for seafood in Coos Bay. When this vibrant, luscious plate of grilled seafood and mixed vegetables arrives at your table, it might be hard to decide where to start. Should you grab a bite of the rich, flaky tuna? How about a prawn? Maybe you could be really innovative, and have some mixed vegetables or pasta before diving into the seafood. The choice is yours. Many fisherman might recommend you go for the lingcod before anything else. As its flaky, scrumptious breading gives way to delicate, buttery meat you will probably thank them for their help. There is no other fish in the ocean quite like the lingcod. Arising from an ancient lineage, the lingcod is the last of their kind. They have no relatives, and are thus unique in the world of fish humans eat. They are prized world over for their taste and texture, which compares favorably to halibut. Their relative abundance across the Oregon Coast means Chef Zamora can pick the best possible fish to be featured on an evening’s menu, and his delicate hand in preparing the fish he selects means the flavors come across clean and bright. Pacific bluefin Tuna is one of the most important components of the Oregon fishing industry. One tuna can weigh more than one hundred pounds, with the biggest examples tipping the scale at more than three hundred pounds. Bluefin are world-travelers, circling the Pacific in great migrations, following either food or the arcane logic of fish, and ending up off the Oregon coast in droves. This is fortunate for anyone looking for the best tuna on the west coast, because it can be found in places like Coos Bay. Those who manage to discover Hilltop House will be particularly delighted: his grillwork means that the tuna retains its brilliant texture and complex umami flavor. The prawns have also spent their time on Chef Zamora’s grill, and to brilliant effect. Once again, the name of the game is “delicate.” It does not take much to overcook prawns, but too little heat and you miss the assertive flavor brought out by searing. These prawns maintain that perfect balance. Also, they are conveniently sized to take in one bite, so you can space them out over the course of the meal. 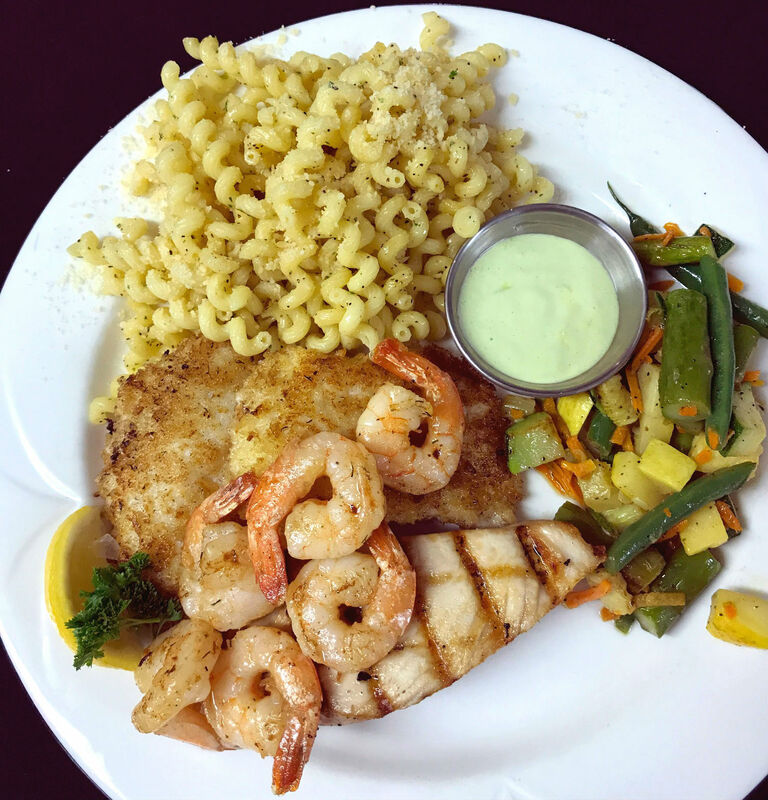 All this delicious seafood is paired with Chef Zamora’s own mixed vegetables and garlic pasta. Though simple in concept, these supposed side-dishes have become well-known to everyone who has eaten at Hilltop House. Again, even the side-dishes are all about execution. The pasta has bite, the vegetables both give and snap… it’s attention to detail like this that keeps people coming back to Hilltop House Restaurant whenever they are in Coos Bay. It’s also what helped Hilltop Restaurant to win the title of Best Restaurant from the Coos Bay World for 2017. If you are travelling the Oregon Coast, or whether you have a 97420 or 97459 zip code to your name, you owe it to yourself to check out the best restaurant in the biggest city on the Oregon coast. Chef Zamora would suggest you try and come sometime around sunset. He would also suggest that you call ahead for reservations. Understandably, the restaurant has a lot of fans. Become one today. Come visit Chef Zamora and his amazing crew at Hilltop House Restaurant today!